The hills remain the same. Smog already present. Extra! Extra! Tweet all about it. ….Ron Henggeler linked me to rare footage of San Francisco shot in 1906, only four days before the 1906 earthquake. Now and then, on my bike, I try to imagine the way things were when the safety bicycle was in use, say between 1900-1910. B.C. (Before Cars). How things might have looked, smelled, etc. 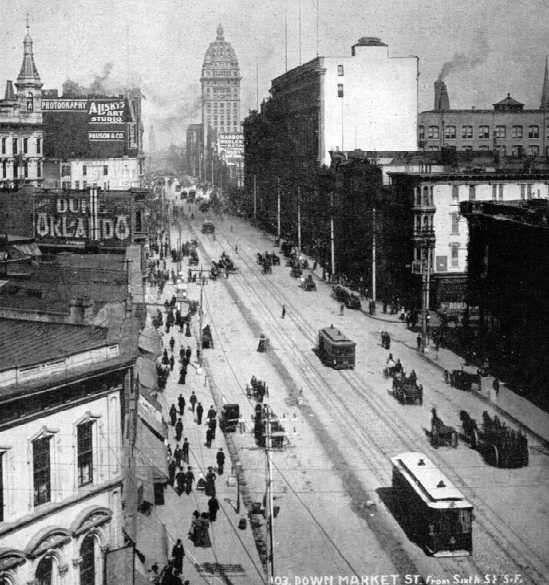 I like to think they had a decent transportation mix: walkers, bikers, horses and streetcars, but you can see the automobile (without benefit of road striping or traffic lights) interfering with it all. If you have 8 minutes to go back in time, you will also note how very few women appear. Scholars tell us that ’06 was still the Dark Ages for women, and very few were seen out and about, unless they were on an extreme shopping mission…or someone’s maid. Or that other thing…the so-called world’s oldest profession. I know there were older ones than that–soothsaying, mudwifery, cave painting & stencilling, baby-sitting, and acorn-gathering. I’m sending you this cuz I can’t get email for a few days. At least my comment section will work. ~ by jacquiephelan on January 16, 2010. Gee!! I had no idea that the music of the era was so progressive. Actually I was waiting for either of the cyclists to go down on the cable groove, but neither did. And one rode it for quite a while. I guess it’s smoother than Pave, but I never had that kind of luck with the trolley tracks in the Bronx. Well, here’s a little something that might make you feel better about the state of women and bicycles circa 1900 – it’s some 1903 footage of Parke-Davis employees leaving from work one evening. I downloaded it from archive.org…I think. I’ve had it on my computer for so long I don’t remember where it came from. Aha…I think this may be where I had found it originally. Yah, women on bikes frowned upon — ESPECIALLY in [SHUDDER] PANTS!! Bloomers, maybe, but pants? For that you would have been shunned, or perhaps arrested.